You know that something important has been discovered in the solar system when Mike Brown is tweeting every few minutes about it - which yesterday was the case with 2012 DR30: the originally pubished orbit from Feb. 26 (at first revised slightly only) had a semimajor axis of 160 AU, corresponding to a period of ~2000 years, but Brown has heard that the semimajor axis could be 1400 AU which would mean a periode of roughly 50,000 years. This is based on an arc from Jan. 3 til Feb. 28: If true, the eccentricity would be 0.99 (instead of 0.91), since the perihelion distance is only 14 AU - 2012 DR is about as close as it gets to Sun & Earth now. But why wasn't it found earlier? The body - with an absolute magnitude of 7.2 roughly 200 km in diameter shines at 18th magnitude now, easily caught by several amateur astronomers who found it to be star-like without a coma. Yet the high-inclination orbit with i~75° (diagram), the huge eccentricity and perhaps a sudden turn-on would surely speak for a cometary nature. Observations with big telescopes are now called for to find out. 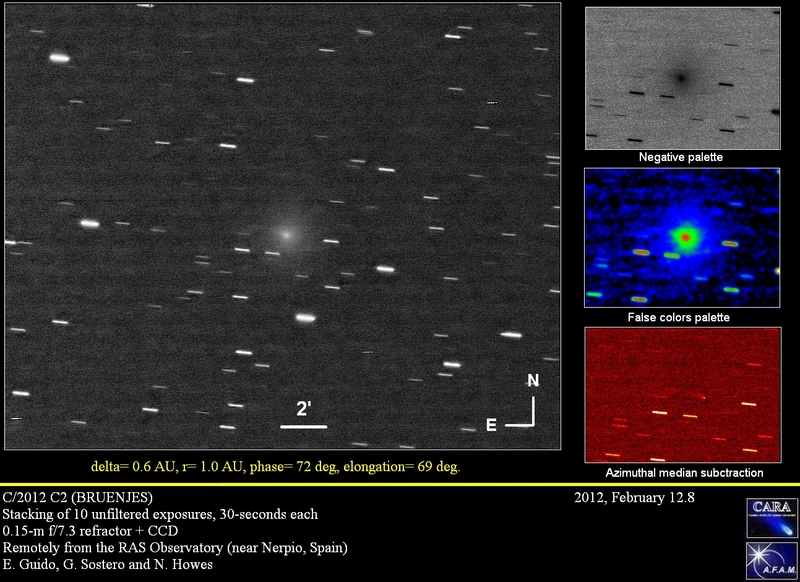 Incidentally there is another asteroid on a comet-like orbit, but the elements of 2011 YU75 are not nearly as extreme. Among the planets Mars is approaching opposition on March 3rd - and despite it being about as far away from Earth as possible, some nice pictures have been obtained, e.g. on Feb. 26, Feb. 25, Feb. 20, Feb. 19 and other dates. • There was a nice constellation of the Moon, Venus & Jupiter on Feb. 24-26 (also on Feb. 27; more and more pics - and the Moon only 18 hours old on Feb. 22 and Jupiter on Feb. 10/11). • A NEO of radar interest in 2013 is 2012 DA14, of which more observations are needed - dito for 2011 AG5 which has a small impact probability of 1:625 in 2040 (causing unnecessarily alarmist headlines here, here and hier - bored of Apophis, eh?). • And why were there so many fireballs in February, all unrelated? The Sun was partially eclipsed by the Moon but only for the SDO on Feb. 21 - also an animation of the May ASE. • There were 5 eruptions on the Sun in rapid sequence but no low-latitude auroral comsequences. • The temporary loss on an amateur dish receiving STEREO quick data (see also here and here) was mildly worrying, this blog has confirmed. • Feb. 19 aurora over Ireland, a rocket launch during an aurora, the Jan. 22 aurora from the Shetlands (from this site), ISS aurora video also featuring a nightly impactcrater and an astronaut-endorsed older ISS aurora video with 3D-like effect. • A timelapse video from Paranal and how it was made, a crazy sunrise (also discussed here) and universal scales interactively animated. • The highlights of March include the Mars opposition, the evening apparition of Mercury and the close approach of Venus & Jupiter on March 13. Well, nerd news rather, as none of the interesting comets making headlines in speciality media are bright enough for general (or even general amateur astronomical) interest - not even C/2009 P1 (Garradd) which is now at its best and even circumpolar for Northerners. With three tails, a regular dust and plasma tail in one and a dust anti-tail in the opposite direction, but only 6.5 mag. The highlight so far was certainly the close passage to Messier 92, and astrophotographers were hard to stop: selected pictures of Feb. 14, Feb. 12 (more, more), Feb. 4, Feb. 3 (also an APOD; more, more, more, more, more, more, more, more, more, more and more), Feb. 2 (more, more, highly processed, more and more), Feb. 1 (b/w) and Jan. 31 - and a paper on Garradd's chemistry. 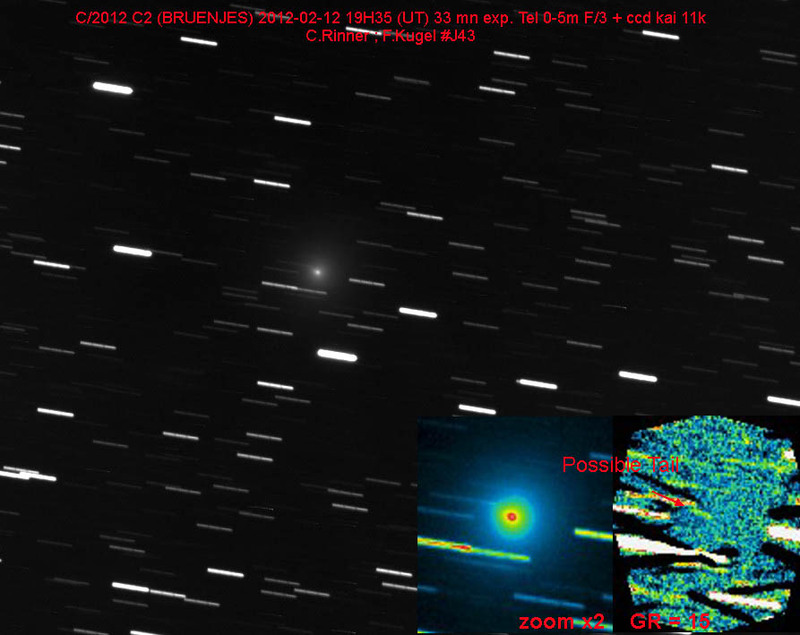 In other comet news there were several amateur discoveries, C/2012 B3 (La Sagra) (more), C/2012 CH17 (MOSS) and C/2012 C2 (Bruenjes): the discoverer's report about the 3rd comet and pictures here, here, here, here, here and here. • Other recent comet discoveries were C/2012 C1 (McNaught), P/2011 VJ5 (Lemmon) and P/2012 C3 (PanSTARRS); also the recovery of P/2003 T12 (SOHO). 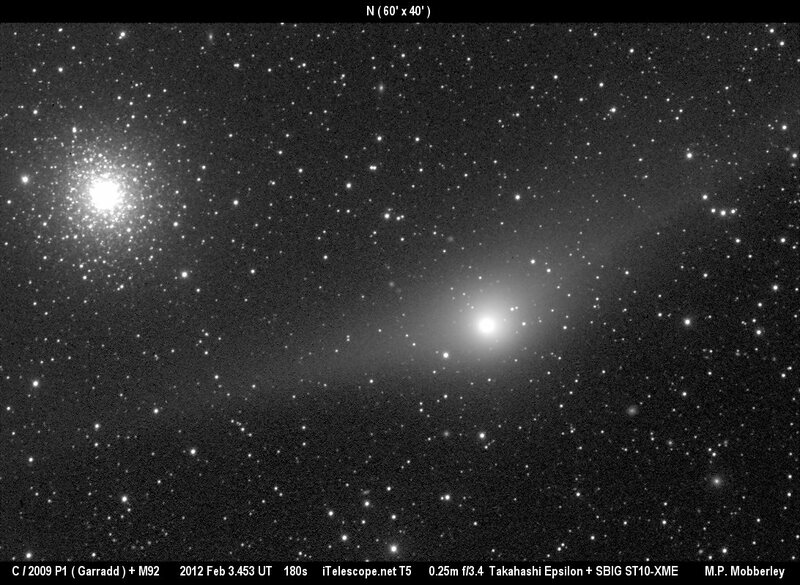 • Finally comet Lovejoy is heading north again, with a deep picture of Feb. 12 from Oz showing a 7° tail in Lepus - observers on the N hemisphere could now get lucky, too; though the comet has nothing of its former beauty of Dec. 2011 left. Several bolides made headlines in the U.S.: in Texas on Feb. 1 (further analysis here, here, here, here and here), Virginia & al. on Feb. 3 and Feb. 13 in the Carolinas (TV clips, more, more, more and a joke ...). • Also the NASA fireball network, and one of the fresh Mars meteorites has come to the U.K.. • During its close approach to Earth (433) Eros 'passed' some satellites; more pictures here and here and coverage here, here, here, here and here (funny lede). • Also a Kalliope mutual events campaign, detailled NEA discovery stats, the discovery of 2012 BX34 and the NEOShield study (mehr). Elsewhere in the solar system the unique binary KBO 2007 TY430, the orbits of big KBOs, southern KBOs and a great 5-minute talk on where Pluto fits into the solar system. • Mars pictures of Feb. 7, Feb. 4 ... 7, Feb. 4 and Feb. 1, two new small satellites of Jupiter and Venus, Jupiter & the Moon in the coming days. • Regarding the Sun a paper on the latitude dependence of the maximum duration of a total solar eclipse, observations by CRATER of the recent flares, X flares vs. time over solar cylces, 10 years of RHESSI flare monitoring and insights on flare physics, the solar B field, H2 in sunspots, the solar climate role (minimal) and storm risks. Elsewhere in the Universe a 1923 nova in M 31 erupts again (more) and a big conference poster on the Eps Aur campaign. • Stories on the U.S. Naval Obs. and the leap second indecision - section 3.4 of the Dec. 2011 R.A.S. Council Meeting Minutes is also interesting here as apparently U.K. hope was lost at that time (later the leap second won and the U.K. was credited for that). • Finally a surprise aurora Feb. 14 in Minn. and Alaska, a TV feature on aurora chasers in the U.K., an aurora video from Oz (Jan. 22; still) and more space timelapse movies here, here and here (the latter from the ISS and w/aurora).